There are no cats in hospitals. | MEOW hear this! Which is where I currently am. Nothing horrible, the boyfriend just had to get a tiny bit of spinal surgery done. Amazing what they can do these days. Just clip out the bad ol’ disc and pop in an artificial one! No worries. There is, however, a lot of waiting. While this hospital seems to have everything operating like a well-oiled machine, there is still, nonetheless, a lot of waiting. Arrive 3 hours before surgery. 1 hour with anesthesiologist. 1.5 hours of actual surgery. 1.5 hours of recovery from anesthesia. This is where I’m at now. Waiting for him to be brought up to his room. So much better than the surgery waiting room, which is pretty small and REALLY full of people. Especially when there is an entire Italian family waiting for one particular patient. I prefer to wait alone. I’m not good at waiting. I’m impatient. I was never actually worried, because I do have a rather large amount of faith in modern medicine, plus I did an awful lot of research so I knew exactly what the risks were and the benefits and the procedure, all that junk. Granted, it’s easy for me to say since no one was cutting ME up, but the person being cut happens to be someone I love very much and would prefer to keep in one piece. No, I’m just antsy. Give me a couch and a book and I’ll sit there all day, but give me the same book with an uncomfortable chair and tell me to read while I wait for something and it’s an entirely different story. So while everyone and their mother (literally) offered to keep me company, I declined. Antsy and impatient are much better alone. But since this blog is about cats, I should probably tie that in somehow. Maybe if I could bring the kitties to entertain me while I wait. A cat-petting waiting room. Probably not very sanitary. I feel sanitary is really at the top of the list at a hospital. And as far as hospitals go, this one is pretty decent. Even got a black bean burger for lunch. But I’m probably going to have blood clots in my legs from sitting all day, because although they put some of those compression socks on the boyfriend to avoid blood clots, they do NOT pass those out to the waiters. 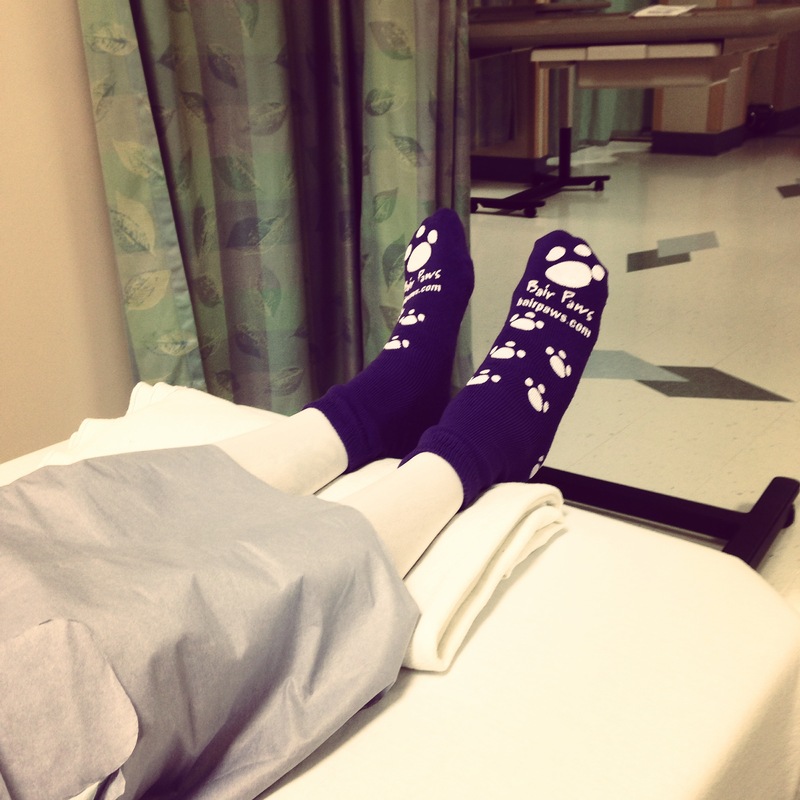 Who doesn’t love a good pair of compression socks and snuggle socks? Pro tip of the day: bring your own. If there is ever a next time, I will know to do that. But I’ll still leave the furry sons at home. No smuggling.